Formally speaking the object corresponds to a starkly reduced oversized auto. Windows, doors, and wheels are missing, the object with its chunky angularity functions as a closed room. The viewer is unable to take in the usual interior views, apart from where the fractally split front affords a peek into the interior construction. 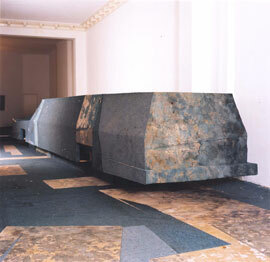 When the viewer enters the exhibition room- the former home of a video store-the back of the object is at first observed. The viewer must walk several meters alongside the auto before reaching the deformed hood. Without wheels the car has collided against a barrier at full impact. The viewer is witness to a constructed accident. In the room there is no indication of where the auto could have driven from, the display window separating it from the parked autos outside is unbroken. 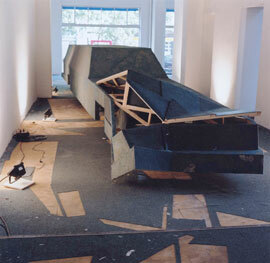 The object challenges the imagination and reasoning of the viewer; abstractly one allows the auto to crash through the window and at the same time one observes the process of its assembly in the room. 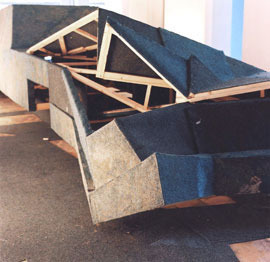 Parts of the blue carpet from around the room serve as a base material. Like in a computer graphic where surfaces are texture mapped, the carpet is layed over a wood construction. 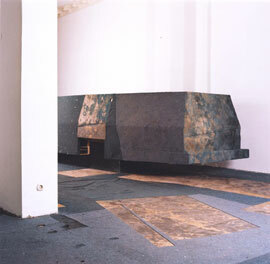 The object refers both to the surroundings as well as the surface of the floor. In his imagination, the viewer re-considers the object in terms of its parts and matches them to the voids in the carpet, something that is analogous to a mental skinning of the object. Skin becomes carpet, carpet becomes skin, body becomes surface. Via the revealing of its making, a play of thoughts between construction and deconstruction is set in motion.